Speaking of bring / brought / brought, people often get confused about when to use “bring” and when to use “take.” Some people use the two words interchangeably, but they aren’t interchangeable, or they aren’t if you are trying to communicate clearly. 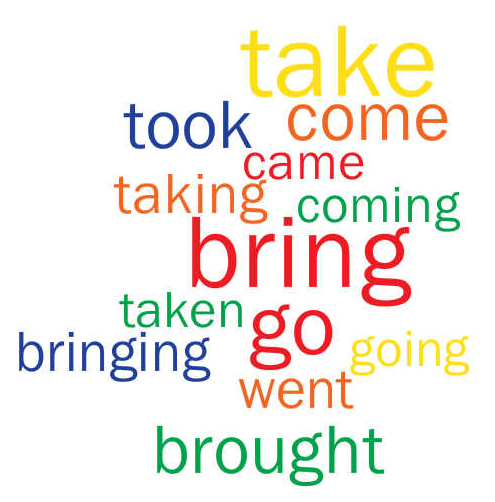 “Bring” vs. “take” is easier to understand if it’s compared with “come” and “go,” because both pairs are distinguished by viewpoint. Harry is coming at 8 tonight. He is bringing Hermione and Ron to meet us. Harry is going to Hogsmeade. He is taking Hermione and Ron. I’m coming to the potluck. What should I bring? I’m going to the potluck. What should I take? Come to class on time and always bring your stylebooks. Go to class on time and always take your stylebooks. This doesn’t mean that it’s one-or-the-other: sometimes, either “take” or “bring” works, but the emphasis is different depending on which word you use. If your mother says, “Make sure you take a sweater to the office,” it means more or less the same thing as “Make sure you bring a sweater to the office.” “Take” simply puts more emphasis on the fact that you are carrying the sweater away from home, while “bring” emphasizes the fact that you are carrying it to work. Either way, you won’t get cold.